Cop drama The Detail cancelled at CTV after one season | TV, eh? It’s one and done for The Detail; CTV has opted not to order another season of the cop drama. 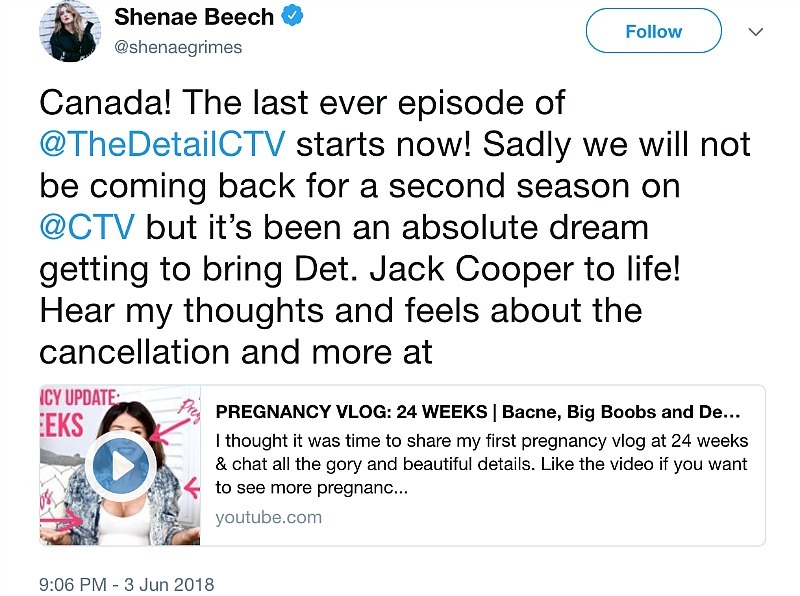 “CTV was so lovely, they were so passionate about the show and I know everyone really wanted it to go again,” Grimes-Beech continued on her latest YouTube post. “Unfortunately, due to finances, I think, and ratings and all of that kind of stuff it won’t be going again. I loved that show a lot. It was so much fun being a badass homicide detective and it was so much fun getting to play Det. Jack Cooper.” You can watch the full video below. Developed by Ley Lukins (Saving Hope) who served as co-showrunner and co-executive producer alongside Adam Pettle (Saving Hope), The Detail was a 10-episode adaptation of the UK smash Scott & Bailey and starred Grimes-Beech as street-smart Detective Jacqueline “Jack” Cooper, who has keen investigative skills but a messy personal life. Angela Griffin starred as Detective Stevie Hall, a sharp quick-witted interrogator who is Jack’s mentor. Wendy Crewson played Staff Inspector Fiona Currie, the homicide unit’s boss, who works overtime to secure justice, no matter what the cost. Supporting cast included David Cubitt as Detective Kyle Price, Stevie’s ex-boyfriend and new co-worker at the division; David Ferry as Harry Barker, Stevie’s stepfather and retired cop; Matthew Edison as Stevie’s husband Jono Hall; Ben Bass as Marc Savage, Jack’s boyfriend; Al Mukadam as Detective Aaron Finch; and Matt Gordon as Detective Donnie Sullivan. Executive producers included Ilana Frank (Saving Hope), John Morayniss (Bitten), and Linda Pope (Rookie Blue), with co-executive producers Jocelyn Hamilton (Cardinal), Sonia Hosko (Saving Hope) and Gregory Smith (Rookie Blue). The Detail‘s lack of a renewal is the latest move by Bell Media; the broadcaster announced InnerSpace and Daily Planet would not be back. That’s a shame even though I was never really enamoured with it. I found it a bit too serious for my taste. Loved the cast though. They keep cancelling the good ones. Getting to be a boring channel. I agree..just when you really like a new show it’s cancelled..come on CTV give it a chance!! Sad. My wife and I enjoyed it very much. So glad they didn’t leave us hanging with final episode. Hope they rethink this decision. Sorry to hear, was enjoying from outside Canada. Good luck to cast and crew, hope they find new projects soon. I’m sorry to hear this news. I really enjoyed the show, the cast was great. Very happy to have seen David Cubitt in a new show. I still miss Traders! This show is absolutely fantastic. I am so sad !!!!!!! Come on CTV give The Detail a 2nd season! Darn. It was a CTV original series I actually liked. That’s toi bad. I’m so pissed ! I loved that show! Why are the good shows cancelled! Is it because it was women who were the leading roles? I wish CTV changes their minds! The Detail is a great TV show! I am absolutely disgusted. I was a fan of the show from day one. Loved the cast and the friendship between the female detectives. The lack of excellent Canadian shows are few and far between. We get a good one and the cancel it. Do the right thing and change your mind and bring it back. Loved the show but hated the last episode. I hated the shooting death of the lady in the truck who stopped. That really bothered me. Loved the cast together but wasn’t wowed by the acting in each episode or was it the writing? Dunno. Still PVR’d it every week though! Would have watched for its return in season 2 too. Wonder what Kyle was going to tell Stevie…..
Just watched Season 1 and really liked it. Degrassi Lover by the way! Shenae Grimes. Just looked to see if there was a season 2 and of course not. WHY? I am strongly inclined to agree with you Kay. The Detail was a quality production and it is too bad that they could not get another season.